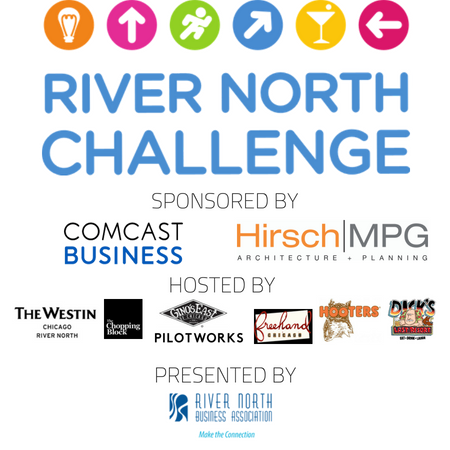 Our favorite group competition and team-building exercise, the 9th Annual River North Challenge, will be taking over the streets of River North on Wednesday, July 11! Assemble your crew, participate in physical and mental challenges, and best of all, have fun at this entertaining tour of businesses in River North. More than 400 Chicagoland residents and corporate participants are expected to vie against each other in the ninth annual event on July 11. It’s a classic battle against the clock as teams travel through the vibrant neighborhood to compete, socialize, and experience the thrill of victory and the agony of defeat! Teams of four will visit checkpoint “Challenge Stops” to complete fun challenges and refresh themselves with complimentary food and beverages. At each location, teams will have the option to perform a physical challenge or a mental challenge – or both – to earn points. Upon completion, each team will receive a passport stamp before moving to the next location. There are also opportunities to solve riddles for extra points at “Bonus Stops” along the way. All groups finish at the Official After-Party, where winning teams and best costume winners are awarded prizes. This year we have two themes, and two different costume contests. Round up your fellow crusaders and come dressed as your favorite Superheroes, or show off your corporate pride by showcasing your company logo in a daring, stylish or pure business manner. Hats, shirts, jackets, pants and even shoes are eligible sites for company names and logos. Creativity will be the key to success!